This week our hostess is Lemons for LuLu and our secret ingredient is CARAMEL. Head over to Lemons for Lulu and link up your fabulous recipes featuring caramel, then come back on the weekend to vote for your favorite. Maybe one of you will be crowned the next Iron Chef Mom! Last week, I planned to make these Pumpkin Caramels for our pumpkin feature. I never got around to it, so this week, I decided to take the plunge. I made a few changes...like no pumpkin seeds. Not because I have any dislike for them. No, it's because every time I make them, the kids eat them first. I pretty much was forced in to ignoring the candy thermometer. Every time I put the candy thermometer in, it was registering soft ball stage. Basically...broken. I had to get out my handy Better Homes & Gardens book to look up the old fashioned cold water method for testing candy. The recipe calls for good maple syrup. Step away from the Mrs. Butterworths. Save her for pancake. This recipe needs the GOOD stuff. The stuff your best friend brought back from her trip to upstate New York. The stuff you don't actually allow your family to use on pancakes because it's too expensive for them to drown their breakfast in. 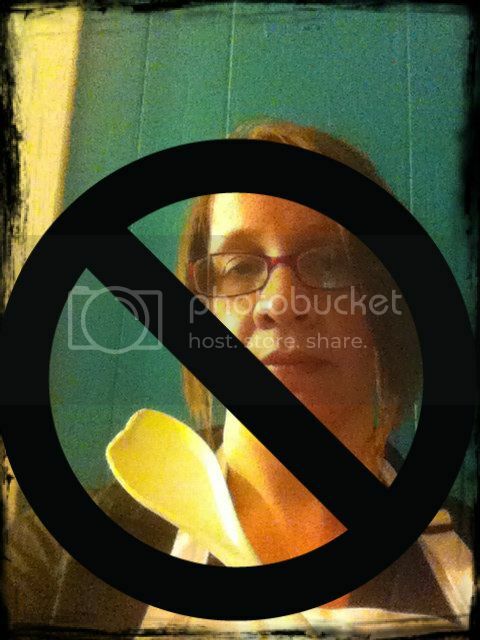 That would be my plastic spoon. Do NOT let this happen to you. When making candy always use a wooden spoon. Four packs can be found at that big W box store for 88 cents. In a saucepan, combine heavy cream, pumpkin puree and spices. Heat on low, making sure not to boil or scald. As soon as it is warm, turn off the heat and set aside. In a second heavy bottomed pan, with sides at least 4 inches high, combine the sugar, both syrups and water. Stir until the sugars are melted, Then let it boil until it reaches 244 degrees (the soft ball point on a candy thermometer). Slowly add the cream and pumpkin mixture, and slowly bring this mixture back up to 240 degrees as registered on a on a candy thermometer. This should take close to 30 minutes. Watch carefully and stir it frequently once it hits 230 degrees to keep it from burning at the bottom of the pan. 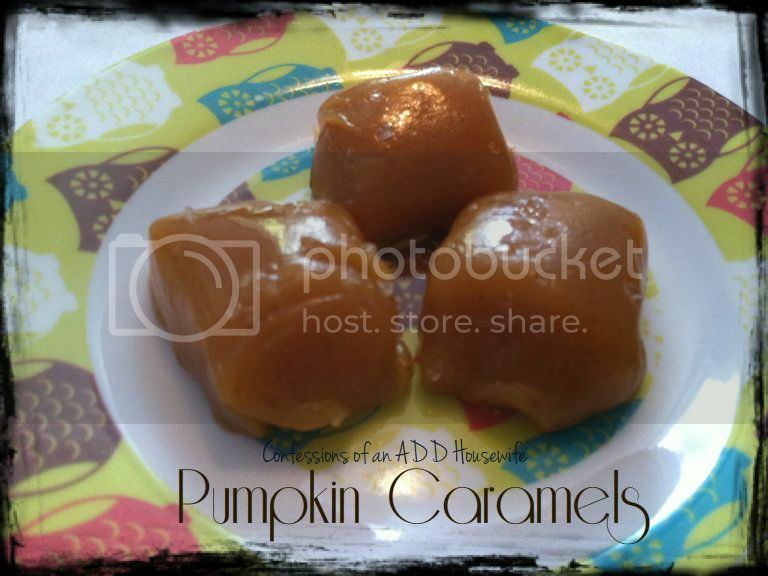 Yum--I love caramel, and I bet with pumpkin it would be awesome! These sound inredible! Thanks for sharing! These sound so amazing! I'm drooling. Yum. Caramels are my favorite so is pumpkin. Thanks so much for linking up to Creative Thursday. Can’t wait to see what you share this week! Have a wonderful week. Micki, these look delicious. I'm featuring it tonight at Project Queen's Highlight Party. Thanks so much for sharing them and the recipe.